First thing first, you need to realize that the premise behind The Rise Of Renegade X is pretty silly - a world made up of super-heroes and super-villains. The super-heroes are out to thwart evil and act as good Samaritans. The super-villains are out for money, power, and to annoy the super-heroes. It reminds me of the farcical nature of The Impossibles. I also immediately thought of White Cat by Holly Black, but I never believed The Rise Of Renegade X 's world like I did the world of White Cat. Don't let that you prevent you from picking up The Rise Of Renegade X . Ignore the urge to occasionally roll your eyes and focus on the real story. Damien is trying to discover who he is. He grew up idolizing super-villains and fully expected to be one himself. He is a snarky, arrogant, brash trouble-maker who has a comment and complaint about everything. Even though he's an irritating boy, I loved his voice. His sarcastic look on everything made me laugh throughout the book. Damian is forced to question his future and his identity when he discovers that he is half super-hero and half super-villain. His actions will dictate which direction he eventually goes. At first the choice seems easy: super-villain all the way. He is still kinda in love with his super-villain ex-girlfriend Kat. He and his mom are pretty close. His new super-hero dad is goody-two-shoes boring. His new siblings are irritating. But as the book goes on, he has to question everything. His cool mom and super-villain friends make some choices that rub him the wrong way. His super-hero family may not be that bad after all. What life will he choose? Another large aspect of this book is a love triangle between Damien, his ex-girlfriend Kat, and his sidekick Sarah. This is one of the best depictions of a teenage boy's confusion about girls that I've read in awhile. He and Kat broke up when he caught her cheating. But he can't let go. Does he just want to be friends or does he still love her? He doesn't really know. Then there's Sarah, his new sidekick. There's definitely physical attraction on both sides, and their personalities make them a great pair. Yet Damien still can't stop thinking about Kat. Who will he choose? 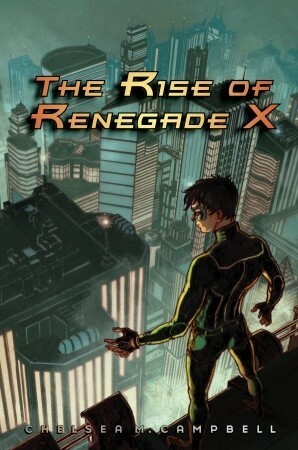 I thoroughly enjoyed The Rise Of Renegade X. Yes, it's silly, but it has a great underlying story of self-discovery that feels universal. I've heard a bit about this one. I'm glad that you enjoyed it. Sounds like a quick, fun book to read. I know a few kids would really enjoy this one. Thanks for the recommendation! Is it a graphic novel or does it just have a graphic novel-esque cover? I'm curious about Damian's confusion with regard to girls, it's always fun to read that type of situation from a different point of view:) Awesome review Alison! Looks really interesting. Thanks for the review! I have to be honest: the premise does sound just a tiny bit ridiculous, but I see potential for great fun too. And having you compare it to White Cat, no matter how small the similarities, definitely piqued my interest. Great review, Alison! This is one that my 8th graders love. They've passed my copy around all year. It's a cute, fun story and I really liked the MC and the "good" Dad and the "bad" Mom--really silly and enjoyable! But then again, going back to the cheater doesn't seem right either. I think I'm going to check this out. I love sarcasm in any and all forms so this seems right up my alley! My niece and nephew love this series. They've been bugging me to read it for awhile now. Sounds cute. This sounds really fun... I wonder if I would have a problem with taking it too seriously though. I hope not, because I think I could really like this one. I thought this was a great, fun read. I enjoyed myself thoroughly with the unique concept. More books with superheroes!